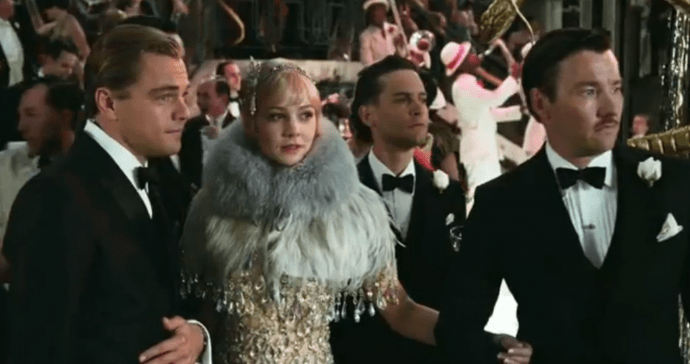 ‘The Great Gatsby’ Movie Trailer Looks Stylishly Epic [Video] | StyleCaster "The Great Gatsby" movie trailer is here and it's just as awesomely awesome as you think it would be. Hold on to your Gucci, Etro and Marc Jacobs Spring 2012 midi dresses ’cause the trailer for one of the most highly-anticipated movies of the year just dropped yesterday. That’s right — I’m talking about the trailer for the Baz Luhrmann directed The Great Gatsby. Featuring an all-star cast including Leonardo DiCaprio (swoon), Carey Mulligan and Tobey Maguire, it might be a little too early to make a judgement call on the flick, but I’m going to put five bucks down that this cinematic ad-ven-ture will be e-p-i-c.
Oh, and can we talk about the maje fashion mo’s going on in this?? Bring on that glitz, glamour and bedazzled fringe ASAP, s’il vous plaît. I also have a hunch that slightly wavvy bobs are going to also make a comeback on the hair fashion front after the release of this film. Think I’m wrong? Well, just watch the trailer below and feel free to give me your two cents by leaving a comment at the bottom of the page.